We are looking a new team member to drive Finnish market and to join our youthful, fun online team in center of Tallinn. The role is to provide excellent customer service mainly via chat and email to our players. 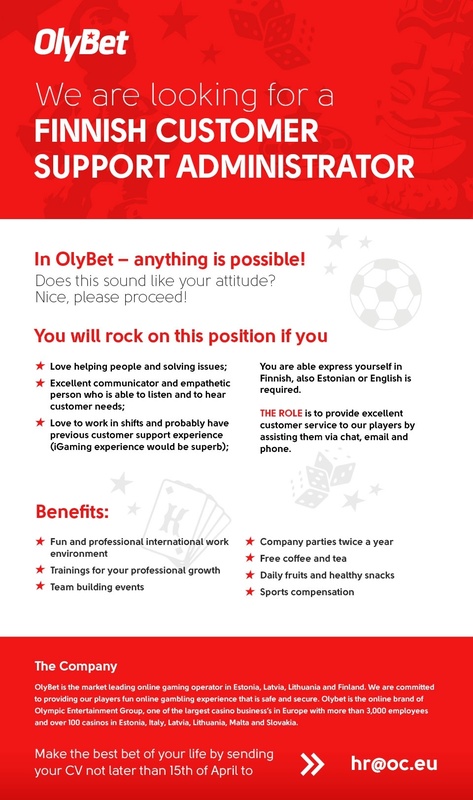 OlyBet is the market leading online gaming operator in Estonia, Latvia, Lithuania and Finland. We are committed to providing our players fun online gambling experience that is safe and secure. OlyBet is the online brand of olympic Entertainent Group, one of the largest casino business`s in Europe with more than 3000 employees and over 100 casinos in Estonia, Italy, Latvia, Lithuania, Malta and Slovakia.